To say that former Los Angeles Police Department Chief of Police Charlie Beck has policing in his blood is an understatement. His father was at one time was the Deputy Chief, two of his kids are LAPD officers, his wife was a narcotics K9 handler, and his sister was a detective. Charlie was born in 1953 in Long Beach, California. He joined the LAPD in March of 1977 after serving two years with the Los Angeles Police Reserve Corps. He rose through the ranks, promoted to Sergeant in 1984, then Lieutenant in 1993, Captain in 1999 and Commander in 2005. A year later, he was promoted to Deputy Chief. In 2009, he was appointed Chief. After spending his whole life dedicated to law enforcement, just recently Chief Beck decided to hang up his badge and retire. As Chief, he oversaw the third largest police department in the United States, managing 10,000 officers and 3000 civilian employees. The City of Los Angeles encompasses an area of 473 square miles, with a population of 3.8 million people and an annual budget exceeding one billion dollars. That’s a lot of responsibility, and he has to leverage a police force that is, per capita, one of the smallest compared to other major metropolitan areas of the U.S. There are 33.2 officers per 10,000 people here, versus 60.2 officers per 10,000 in NYC, 74.4 in Washington, D.C., and 47 in Chicago. He’s been innovative in every position and has been driving the force into the 21st century with reforms and modernization that has mitigated crime, reduced gang violence, contained terrorism and continued the reforms that brought the department into compliance with the consent decree. “This program will be good for e-bikes in general. I think they’re going to be immensely popular in the United States, I really do. I’m amazed I don’t see more of them.” TWO WHEELS As an avid motocross racer, Beck loves being on two wheels. He is a past Police and Fire Motocross National champion and has won numerous medals in state, national and international competitions. His love of riding extends to bicycles as well, and LAPD now has 500 bicycles out on patrol. When he first heard about e-bikes, he contacted Karel Kramer, former editor of EBA and known to him via motocross, and asked to try them. He rode a Stromer city bike but wanted to try an electric mountain bike. We went out together in the mountains of Southern California, and that ride helped solidify his idea that the LAPD needed e-bikes. We ended up consulting with the department several times, including observing their bicycle training curriculum (see page 36). Ultimately, they chose Bulls to put together an e-bike specific to the needs of bike officers. For being the leader of a very militaristic organization like the LAPD, Beck is very personable and seems to impart that friendliness down the line. EBA: Chief, how do you think bike patrols are an advantage in Los Angeles? CB: The big problem with policing in Los Angeles is that we’re a giant, flat city. Nobody ever gets to meet the police officers that work their neighborhood, with exceptions to those places that have a lot of cops in the areas that have crime issues. To the vast majority of the people, we’re just a car driving by. Bikes are just the opposite of that. People have more chances to see you; there’s always some interaction. Bikes are a great community policing tool, and they’re a great way to get around, especially in places we’re responsible for, like Hollywood or downtown Los Angeles. EBA: We talked to several officers about it, and they agree about how much faster bikes are than cars for getting around those areas. CB: Oh, yeah, so much easier! And you don’t have to park; you’re right in the mix from the get-go. They have a lot of advantages. They’re going to be a great tool for us. For us, the weather’s always good, so we don’t have that issue. They’re going to be great, I know that. EBA: I think e-bikes are an amazing part of your legacy at LAPD. CB: I’m hoping it takes off. When you try to explain e-bikes to people, nobody understands exactly how they work. They think they’re something like a motorcycle, which, of course, they’re not. But with the class 3 bikes like our Bulls, our officers can reach speeds of 28 mph, which is really fast downtown!” EBA: It seems like you’re setting a great precedent with this, something that will likely be copied nationwide, if not beyond. CB: I know e-bikes are super popular for commuting in Europe. I have to assume that there are police departments over there that use them. I haven’t talked to any big city departments that use them, but I know they’ll start. It’s just a matter of time. Everybody uses bicycle patrols. This is the same thing, only better! EBA: Something like 90 percent of the American population doesn’t yet know that they exist. CB: How many garages have bikes that never get used? All of them, practically. And the reason is, like my house, I live on a hill. And believe me, coming up that hill finishes you off on a regular bike. You’re done! But on an e-bike, it’s just no big deal. You still get a workout, but it isn’t something you dread. I dread going up that hill on a regular bike! “You can get across town way faster on an e-bike than you can in a car!” EBA: You mentioned that you know of a number of professional bike riders who retired from their sport and are now in law enforcement. CB: I tell people that all the time. They’re very similar. First of all, both of them are about controlling adrenaline. If you’re good at that, you can be good at racing and police work too. It’s about balancing risk, and there’s nothing without risk. But, you can’t take foolish risk. You’ve got to be able to balance risk, you have to be able to function in tough environments, and you’ve got to have some heart. All those things that make good BMXers and good motocrossers make good cops too. When you make a bad decision, it hurts either way! Chief Beck on his first electric mountain bike ride with us back in 2016. EBA: What are your plans for retirement? CB: I’m going to ride my e-bike. I’ll ride my motocross bike. I’m going to work on some non-profit stuff and some policing stuff. Nothing full-time. It’ll be fun, because I’ve been doing this a long time. It’s been a great profession for me. Hopefully your readers will think of it as another way to do something they might like to do as a career. It’s a great career for people who are athletic, and like outdoor stuff and the thrill of making good decisions. 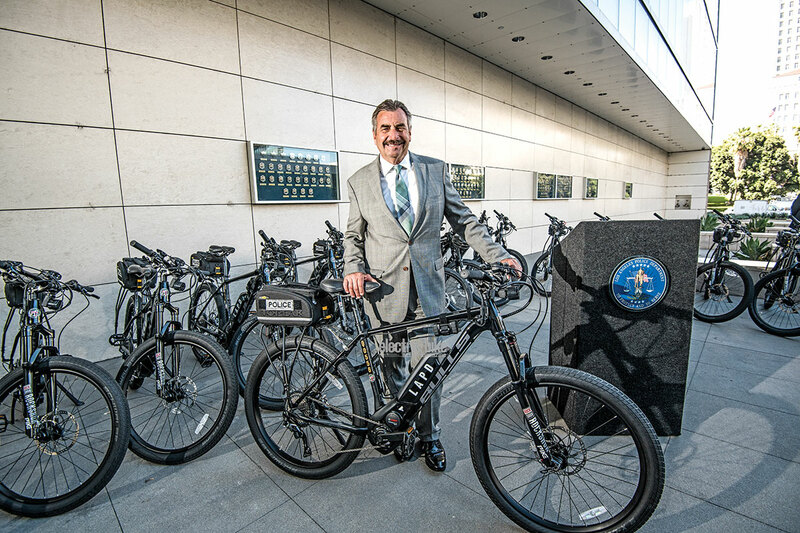 &nbsp; The post LAPD Police E-Bikes and Chief Charlie Beck appeared first on Electric Bike Action. So simple it hurts. If you are the sort of rider who just cannot make up their mind about bar width, or breaks out in a cold sweat whenever the hacksaw comes out, well Ibis have your back! The new Ibis bars use an instet allowing upto 50 mm of adjustment. Ibis have come up with a very clever new bar width solution, their new Hi-Fi and Lo-Fi bars feature a 25 mm wide aluminium insert that threads into the end of the bar allowing you to switch between 750 and 800 mm in minutes, without resorting to the hacksaw. If that&#8217;s too big a step you can cut down the inserts to whatever dimension you need, safe in the knowledge you can return the bar to its original size for just $15. If you&#8217;re the sort of rider who has a 751 mm tree gap on their home trails, but likes to run a full 800 mm for the bike park, these bars may rock your world. The bars will come in two versions, a Lo-Fi 10 mm rise and Hi-Fi 30 mm rise and weigh 238 g and 249 g respectively. The new bars will feature on all Ibis XT, X01 and XX1 build kits and also on other builds for a small upgrade fee. If you want to buy the, they will cost €169.99 with a seven year warranty. The aluminium inserts thread into the bar If desired you could further cut the inserts down to customise your bar While we have to admit we never really had a problem running the same width bars, hey, it&#8217;s always great to have a choice. If you feel the need to change your bar width like you change you shock settings, or you&#8217;re simply width curious the new Ibis bars are an elegantly simple solution. 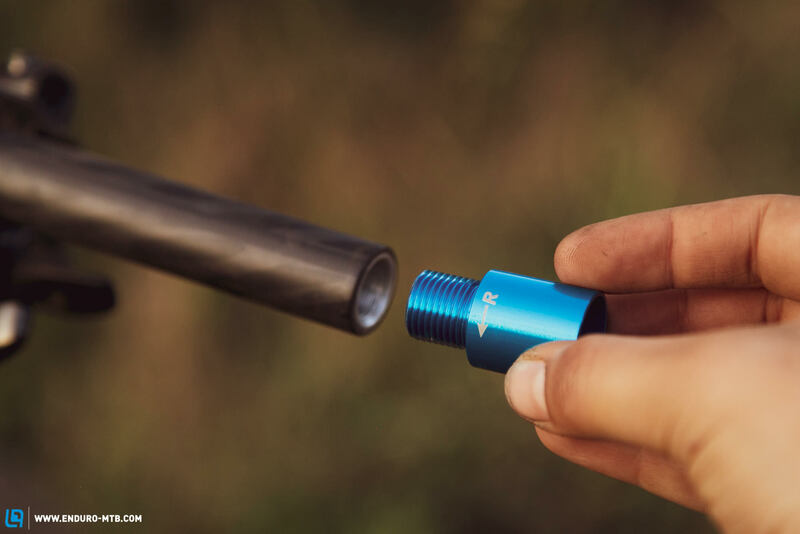 The post Ibis drop new adjustable width bars appeared first on ENDURO Mountainbike Magazine.